Mood swings – HubNut – celebrating the average! I got the BX back on Wednesday. Hoorah! £413 later and it had undergone a thorough re-piping courtesy of Sparrow Automotive. Problem was, the drive home was a bit meh to be honest. That after I’d stepped out of a battered Skoda Felica (thanks for the lift Rob!). Actually, I was quite taken by the Felicia to be honest. However, I woke up today in a promising frame of mind. I was at my desk working by 8am, and was pretty much done by 10am. I refused to curse myself for finally starting a feature I’d had two months to write. I like pressure. It helps focus the mind. That left a good chunk of day. So, I set about improving the BX. There are a million and one things I could try and fix, but I decided to start small. 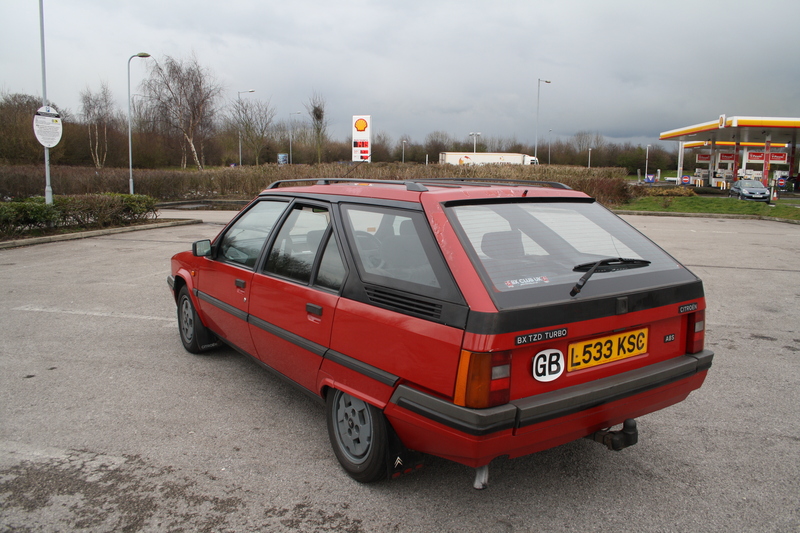 The rear screenwash hasn’t worked at all since I bought the car and reading the Blog from the previous owner on the BX Club, it didn’t seem to have worked during his ownership either – stretching back to 2010. The simple thing to do would be to order up a replacement. I decided to pull out the screenwash bottle and pull the pump apart. I did test the pump by wiring it directly to a battery. Nothing happened. Demolition time. I took no photos of this, so you’ll have to take my word for it. The motor part comes away from the impeller part, so I was able to give the operating rod a twist, then wire it up directly to the battery. It span! Then I reassembled and plugged it into the wiring loom. It didn’t run. Cleaning the contacts improved matters and I now have a working rear screenwash. Result! I did also investigate whether a clogged air filter might be contributing to the horrific smoke levels from the exhaust. It wasn’t, but I did discover a fair dose of engine oil in the airfilter suggesting a breather issue. It’s quite normal for engines to have a crankcase breather to deal with the pressure difference generated by moving pistons. Even the 2CV has one. These breathers can fail, though oil can also bypass the pistons due to ring wear and cause a similar issue. I’ll start with the breather though! Again, I took no pictures because I’m rubbish. Imagine an air filter with some engine oil on it though, and you’ve got a pretty good idea.